If there is a single piece of advice that I would give to the cost-conscious mortgage shopper, it would be to obtain a copy of your HUD-1 settlement statement and study it thoroughly before signing any papers. 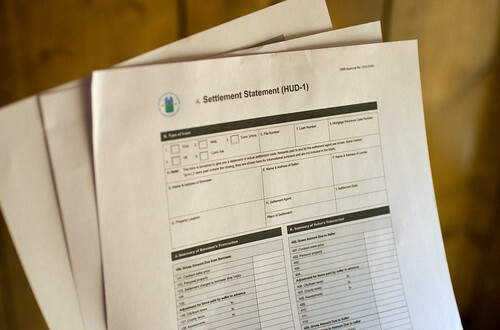 So, what is a HUD-1 Settlement Statement? It’s a standard form that is used to itemize all of the services and fees that are charged to you, the borrower, by a lender during the process of applying for a loan to purchase a home (or other real estate). In other words, a HUD-1 makes it absolutely clear what exactly you’re being charged for by the lender. What are all of the costs included in the “closing costs” of a loan? The HUD-1 will spell it all out. So, how do you get a HUD-1? By law, you’re required to have a copy of this HUD-1 statement to review at least 24 hours prior to the settlement of the loan. In other words, at least one day before you’re supposed to go in and close out the loan, the lender must provide a copy of the HUD-1 for you. On the HUD-1 is a list of all of the fees that you’re being charged in association with your loan. These will vary widely depending on the practices of the lender, but you should expect to spend some time using Google to figure out what all of these charges are. If some of them seem incorrect or unfair, you can dispute it with your lender. If you can’t reach an agreement, you can certainly walk away from the loan. The problem, of course, is that this HUD-1 statement isn’t given to you until just before you’re supposed to go sign the papers. In order to remedy that problem, lenders are now required to give you a good faith estimate within three days of applying for that loan. A good faith estimate is pretty similar to a HUD-1 statement. It lists all of the fees and services and charges you should expect when you settle your loan, except that you should receive that estimate very early in the loan process. Also, lenders must keep their fees to within 10% of what’s stated on the good faith estimate. If the good faith estimate lists $4,000 in fees, they can’t end up charging you more than $4,400 in fees on the final HUD-1 statement. So, what do you need to do to protect yourself as a potential borrower? The first thing to do is to shop around for loans. Don’t be afraid to apply for a few loans. When you do this and successfully apply to multiple lenders, you’ll end up getting several different rates and several different good faith estimates. You can use these to calculate which loan will give you the best deal. You should also know what each of the fees on the good faith estimate and the HUD-1 statement are. A simple Google search will help you to understand any terms that you’re unfamiliar with. One convenience is that the same terms and identification numbers must be used on the HUD-1 and the good faith estimate, making them very easy to compare. If you find something you don’t agree with on the good faith estimate, discuss it with your lender. You can certainly request fee adjustments and other concerns that you might have. Remember that there are some fees that are locked in (origination fees) but other fees can be changed between the good faith estimate and the HUD-1 statement. Knowing the details of the good faith estimate and the HUD-1 statement can make a big difference when it comes to finding the best loan bargain for you and your situation. Not all loans are made the same and these statements can make the differences between loans very clear.